Today Torbay felt like the Mediterranean. Sparkling clear blue sea, unbroken sunshine, white shingle coves. We swam from Fishcombe to Churston, meeting a seal on the way; I have encountered him before (he is well known in the area). The underwater scenes were amazing. The sunlight played through the sea, illuminating the rocks and seaweed. It was mesmerising. We then found a huge slab of rock, the perfect sunbathing terrace. Bliss. It was the first day of what is turning out to be a heatwave. Dartmoor was hazy. We walked along the Two Moors Way from Harford Moor, with the larks singing incessantly overhead. It's such a joyful sound. Everything was vast and and wide and open. A stone row st retched away in the distance on a ridge. It was a long trudge to Leftlake Mire, along the old 'puffing billy' track and by the time we got there, we were hot. The Mire is a perfect swimming pool, with strange cidery water which made our bodies look yellow. What was most delicious was being able to sunbathe after the swim, without immediately having to get changed. Summer has stolen a march on Spring; let's hope it lasts (famous last words). 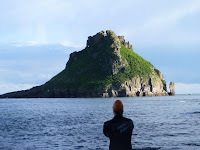 Thatcher Rock, off Torquay, has a movie-mythical air; with its fairy Disney castle turrets, and crags reminiscent of Skull Island in King Kong. But when we got there, it was all about the birds. As we approached, the rancid smell of guano hit us, and the cries of seagulls surrounded us. High above, cormorants circled; Sue remarked it was like being in the Galapagos. Then, at the back we saw a group of glossy shags, like te ddy boys with their jet black quiffs. It was a really amazing swim, travelling from the genteel world of Torquay's Millionaires' Row to the raw beauty and isolation of the island. There were some strong cur rents, which made it challenging at times, but also made us aware of the forces that have shaped this place. 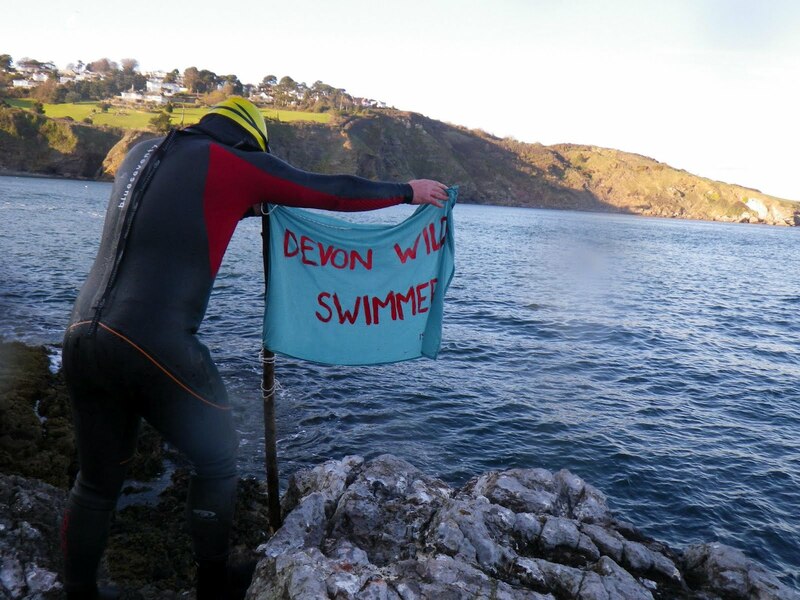 On the way back we 'conquered' the island with the raising of the Devon Wild Swimmers Flag. Long Live the Swimmers! For a couple of days now we've been enshrouded in mist. Kate and I went down to Meadfoot Beach in Torquay; we swam out around Triangle Rock, away from the posh hotel and the beach huts, and into the wilderness of Daddyhole or Thunder Hole as it's somet imes called. Our goal was West Shag - one of several little islands around there, which despite its name was inhabited by a solitary cormorant. As we swam we were surrounded by smokey greyness. We reac hed the island, clambering onto the edge and claiming it for the People's Republic of Swimming. When I was little I wanted to be a Blue Peter presenter, and would walk around the fields near my home pointing out the things of interest to my imaginary audience. Today's swim was a bit like that, except the Val Singleton figure was my friend Sue who has an encylopaedic knowledge of our marine flora and fauna. We were swimming from Broadsands to Elberry in Paignton, where there is a bed of rare eel grass, home to sea horses. You swim alongside the crinkly coastline with its strange rocks like sculptures created by hippies on acid. As well as the delicate eel grass we saw breadcrumb sponge, sea lettuce, dulse, a starfish and sea potatoes (yes, sea potatoes). The latter are a type of furry urchin; there were lots of their shells on the seabed. It was a long-anticipated day. I was finally getting to meet one half of the "Scottish Swimming Lassies" (as I call them), whose blog is listed at the bottom of this page. They are called Charlotte and Iona, and Charlotte is a very old friend of my friend Anna. Anyway, she was down for a visit, and so we decided to take her on a magical mystery tour of.....Torquay. Well you can't get more of a contrast to the wild and woolly Argyll coast, looking out across the Sound of Jura, which is where she swims. The great thing about Torquay though is that just at the point when you are losing the will to live, having driven through endless suburbs, you reach the sea. Its coastline is hidden and magical, full of little coves and beaches with fantastical rock formations. We took Charlotte to Anstey's Cove, and her squeals of delight when she entered the water were a joy to hear. (no doubt it felt tropical in comparison to the water she's used to). Anyway, off we set towards the fairytale pinnacles of Long Quarry Point, and went to explore a cave I've been to before. I climbed through a gap in the rocks and couldn't believe my eyes - a perfect, hidden, secret swimming pool, complete with a skylight in the roof, through which the sun was beaming. It wasn't there on my last visit - it just shows how the tide transforms a place. I think the Scottish lassie brought us luck, let's hope she comes again!